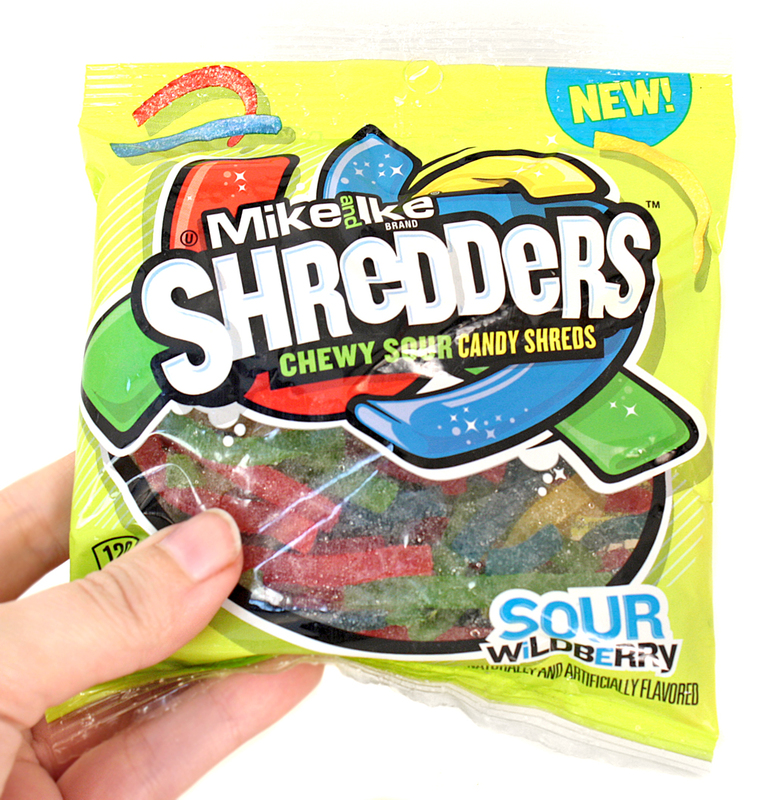 I saw these "Shredders" at the Dollar Tree when they were first introduced and I thought they looked interesting, sort of like mini Sour Straws. Each bag had a little plastic window so your could see the product inside and they all looked kinda...icky. There were two flavors available, this Sour Wildberry one and some pink colored bag with another flavor variety. 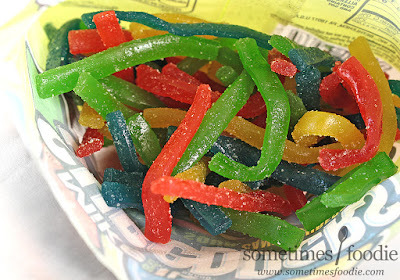 This flavor looked like it had less sour sugar coating and it also looked kind of oily, while the other had a sour-sugar overload! I grabbed the best looking one of each and tossed them into my cart because I'm a food and candy blogger and I can't resist trying new stuff. Then they sat in the giant back-logged food-valanche pile of products I've been meaning to review for over half a year! (So much for being "New.") I'm slowly but surely working my way through the backlog and since we just recorded a Mike and Ike themed episode of Candyology 101, what better time to tear into these bags? 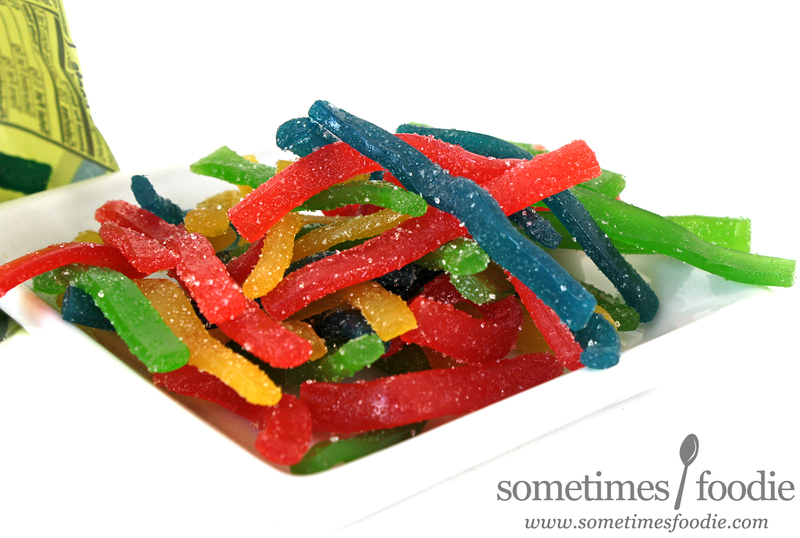 First up, the less sugary-looking of the two, Sour Wildberry! Back to the design and graphics! Looking at this plastic peg-bag, everything is bright, colorful, and appealing. 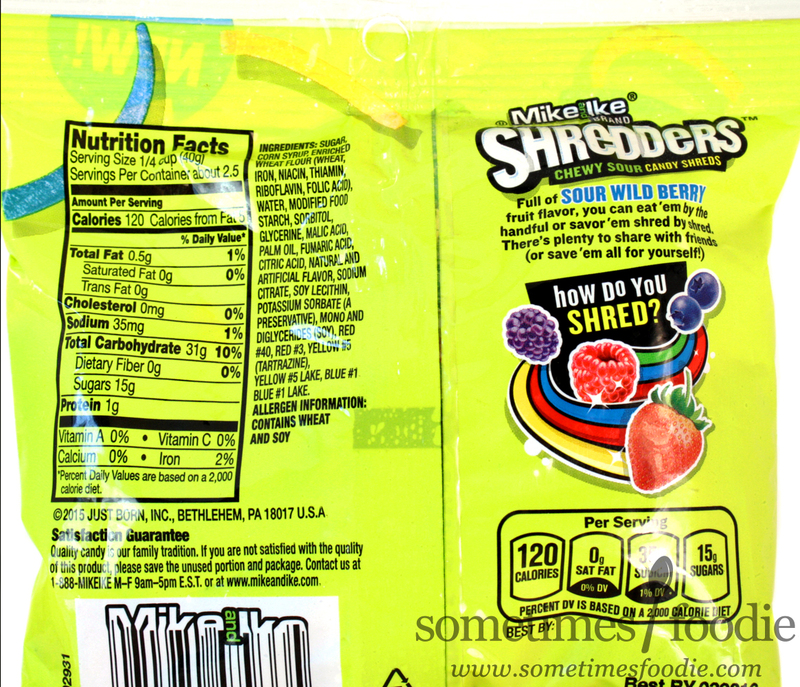 Other than the lackluster looking product inside, the Mike and Ike's design team did a really awesome job! This stood out from the other products on the shelves and, from a design perspective, the graphics are dynamic and appealing bringing new life to this older brand. Red Berry? (red)- Very waxy texture and a very dense red-shoelace-licorice chew. It took a while for any fruity flavoring to come through but towards the end it tasted like typical red licorice with a hint of tanginess. Not bad, but the flavoring took a decent amount of chewing before it really shined. Before that it was like I was chewing midly sour wax. Blue Raspberry? (blue)- We have the same waxy texture, but this one seems less flavorful to me. Towards the end you get a tangy berry flavoring, but it's really artificial and it seems less bold than the red shreds. ??? 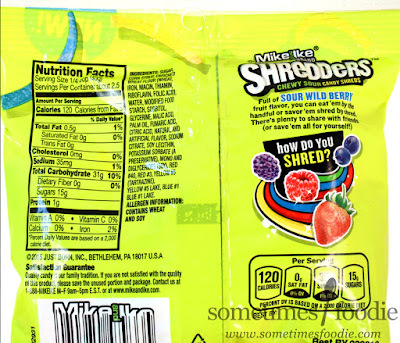 (green) - This is a berry mix, but this is green, what berries are green? I honestly have no idea what this flavoring is. It's sweet and generically fruity, but not very distinct. It's pleasant enough, but if I had to guess what it was supposed to taste like I'd say... Strawberry? I'm honestly not sure, but I didn't hate it. ??? (yellow) - What berries are yellow? This one is another mystery to me, I feel like it tastes just like the green one. Am I crazy? Are these all the same flavoring and just different colors? The flavors are Raspberry, Strawberry, Blue Raspberry, and Blueberry. Thanks for the comment! Glad to know I'm not crazy and that the red really was different from the blue, but the yellow and green are nearly indistinguishable! In the fruit punch ones, the flavors are Cherry, Orange, Lemon, and Pineapple. I thought the blue ones tasted like lemon and the purples like pineapple, while the other 2 had their matching colors.